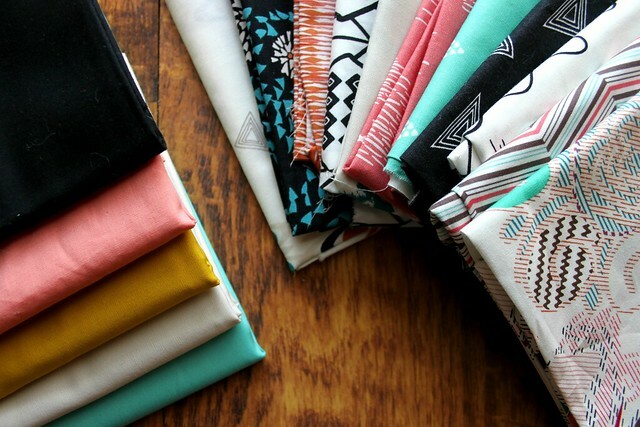 When Pat Bravo's new Etno fabrics arrived at my door, before I could begin to think of a plan, I had to have more! The Dainty Folk colorway in rose pink, soft gray, aqua, and black is a beautiful combination, but seeing them with a punch of Empire Yellow had me wishing for the full collection! A week later I had the rest and yesterday I finally found the time to begin my Etno quilt, which began with lots of 18 patch rectangle blocks, made up of 3.5" cuts of each gorgeous Etno print! I didn't start out with a new quilt as you go in mind. 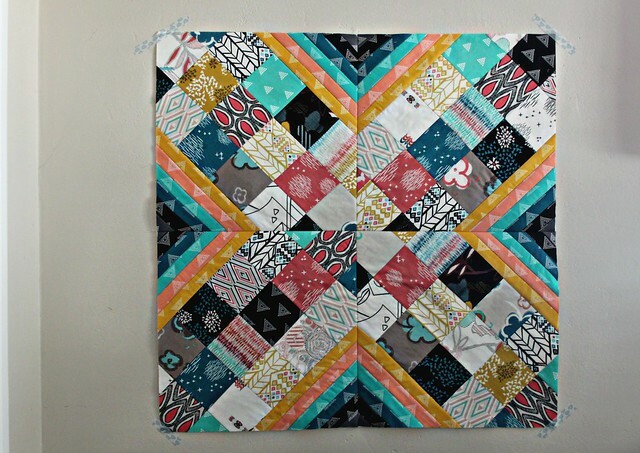 I had planned to frame my patchwork with the solids shown in the first photo, sewing my blocks together in an alternating horizontal and vertical pattern until I had a finished quilt top. But as I sewed, as per usual, I changed my mind! I took away the solids, added in Prisma Elements in a similar color scheme, and immediately was loving where this was headed! For this block I basted my 18 patch center, made up of the 3.5" cuts of Ento prints, onto a 14" square piece of 100% cotton batting on the diagonal. Next I stitch and flip the six colors of Prisma Elements cut into 1.25" strips, working my way from the patchwork edge to the end of each of the two corners, and square up my block to a 13.5" square block. Look how pretty! I'm so happy that I decided to add in these Prisma Elements. These are with out a doubt my new favorite blender!! After finishing four blocks, my Criss Cross Diamond pattern started to emerge, I'm so excited!! The plan is to make a total of 36 blocks (you can see a peek of what that will look like right here) for a finished quilt measuring a large 78" square! Let me know if you have any questions about my quick, written instructions above or if you'd like to see a tutorial for this qayg block? I'd be willing to take the time to share one, if you're interested. Just let me know! Thanks for this. Love the colors. Such a simple way but so effective. I love your block! This quilt is going to be outstanding! Personally, I would love a little more in depth instruction on the QAYG. 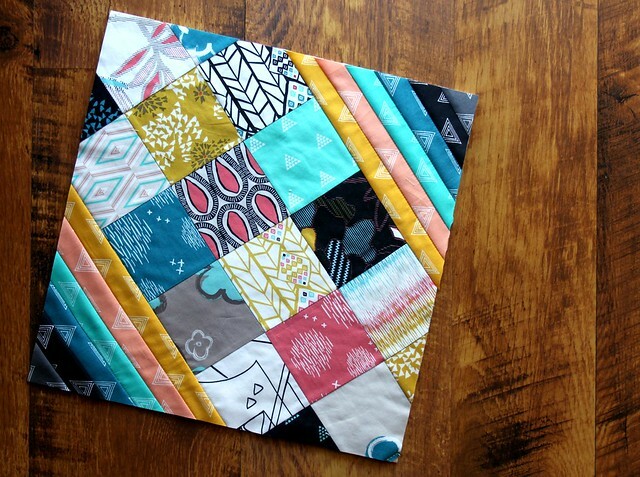 I think it would be great to have the instruction on a quilt I'm going to be making :) I don't know when I'll be able to start, but I really love the looks of this quilt! Thank you for sharing! Pictures 5 & 6 will not load for me! Interesting project! Missing pictures 1,3,5 and 6 but still get the drift. So pretty! Did you save the corner cuts?? I hope you can see them now! Yes, I saved the corners, they are definitely usable scraps! Still missing pictures 1 and 5. Quilt looks great and would appreciate a tutorial since I'm new to the quilting world. I love the block and would love a tutorial. Thank you. Yes love this and a tutorial would be great!!! I love your Quilt as you go pieces!! Gorgeous! I would love a tutorial. Love it and would like a tutorial as I'm not sure what you mean when you said you sewed it on a piece of batting on the diagonal. Also, several of the photos say "This photo is no longer available." Love this twist on the quilt as you go. You have definitely inspired me. I would also love a tutorial and I really like this pattern -- do you have a detailed tutorial for this pattern? Also like others have said, some of the photos are not loading properly! Would like a tutorial for this block please, I love the different blocks you design. Hi, I would love a tutorial for this block. I am wanting to make a wall hanging for my newly remodeled kitchen and the one you did works to so well that it looks like you chose those colors just for me!! Love this block! Would appreciate a tutorial. Great choice of fabrics. This quilt is amazing. A tutorial would be wonderful. Thanks so much for offering to create it. We all know you're a very busy lady. Of course we would like to have the pdf of the pattern. You do such lovely work. What an awesome block Maureen. I'd love to find out more on how you did that block and the QAYG as well. I really love the way this one turned out. Very cool! would love a tutorial. absolutely beautiful fabric. The fabric for this quilt is wonderful. Your block is outstanding. You have really captured the fabric with this block. Great! I really like the effect of those striped corners in these blocks. Wow, lots of seams to match up when sewing together the blocks! Mine don't match up perfectly and as my quilt grows it doesn't matter one bit, I love how it's looking! Yes please, a tutorial would be wonderful. I have been thinking about buying Etno and this has sealed the deal for me. I'd love t o see a true too! I've been jumping in on the QAYG band wages lately and enjoying the ease of peicing together smaller components. Knowing how to join the pieces for QAYG with no strips would be really helpful. Do you put strips on the back? Lovely Maureen! 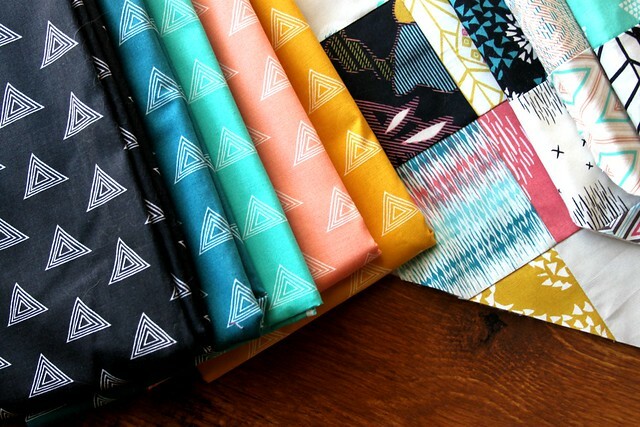 Question though: how do you quilt your QAYG tops once they are finished? You are so talented! This quilt is going to be so beautiful. I can't wait to see what you do with the quilting. It would be helpful if you could do a tutorial - I'd certainly use it. Thanks for sharing your gift with us. Very nice. Love the second pattern showing up and showing off! A tutorial on this block would be Awesome! Love the vibrant colors and the finished design was great! Yes please! I am in love! I would love a tutorial! I have fabrics that would look awesome, but need the help seeing how to put it together. Thank you! 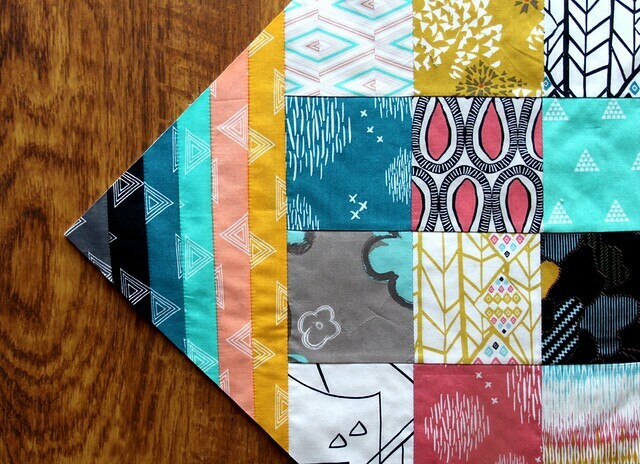 I would love to have a tutorial on how to make this quilt. It is so beautiful. I like where this quilt is going. I'm looking forward to seeing the finished project. 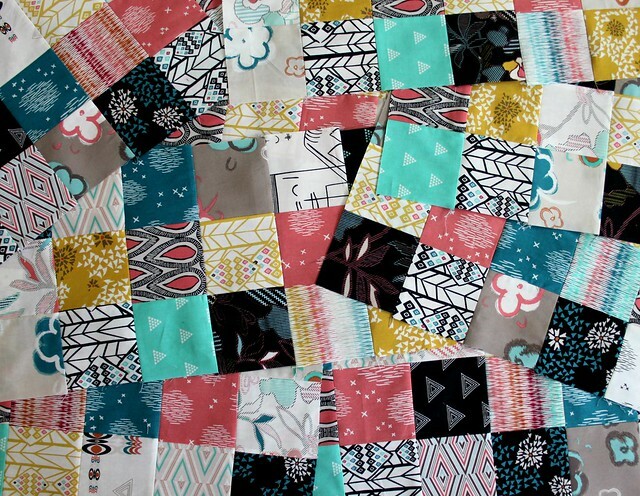 I really love the block and the FB quilt! Keep it going! I always read your blog...but I am not a quilter. I love to sew clothes and have said for a long time that I am just not in to quilting. 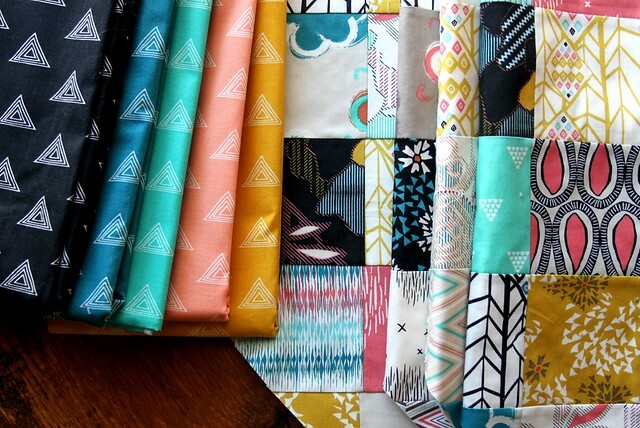 Every time you post a new quilt I start thinking about it though...I really want to try to QAYG! That is coming out so pretty! You have such a great eye for mixing. This is gorgeous. I'd love to see a tutorial. Would dearly love instructions for you Criss Cross Diamond design, so interesting.